Reinsurance giant Munich Re said that natural catastrophe events in 2017 have caused record insurance and reinsurance market losses, with the total industry bill estimated at $135 billion, but insurance only covered 41% of the damage as the economic loss from 2017 disasters is pegged at $330 billion. Fellow reinsurance firm Swiss Re recently put 2017 insured natural disaster losses at $131 billion, so Munich Re’s estimate of $135 billion is not far away, but based on the German reinsurers numbers this makes 2017 the highest insured loss year on record. In fact, 2017 is the second most costly natural catastrophe year on an economical basis, coming second only to 2011 when the Tohoku earthquake and tsunami pushed economic losses for the year to $345 billion, in today’s dollars. Torsten Jeworrek, Munich Re Board member responsible for the firms reinsurance business, said, “This year’s extreme natural catastrophes show how important insurance is in absorbing financial losses in the wake of such disasters. Munich Re is willing to develop this business further – we have the necessary capacity and expertise. The economic loss figure of $330 billion is almost double the ten-year, inflation-adjusted average of $170 billion, Munich Re explained, while insured losses reached nearly three times higher than the average of $49 billion. Munich Re’s statistics team recorded 710 relevant natural catastrophe loss events during the year, well above the average of 605. Roughly 10,000 people lost their lives in natural disasters in 2017, which is a little higher than last year, but significantly lower than the ten-year average of 60,000 deaths. The United States took the lions share of losses, at 50%, much higher than the long-term average of 32% of losses, driven by hurricanes Harvey, Irma and Maria. Hurricane Harvey is estimated to be the largest economic loss of the year, at $85 billion. Hurricane Irma though was the biggest driver of insured losses, at $32 billion. The California wildfires though are only estimated as an $8 billion insurance and reinsurance industry loss, by Munich Re, which is lower than many in the industry had been anticipating. However it is a largely insured loss, with the economic figure only slightly higher at $10.5 billion. Tony Kuczinski, President and CEO of Munich Re, US, commented, “This hurricane season is a stark example of the incredibly important role that Munich Re plays in helping people and communities rebuild in the wake of natural catastrophes. And we learned from these events. First, that mitigation and improved risk management, such as stronger building codes in Florida, can work to reduce losses and promote life safety. Second, there continues to be a substantial insurance gap, even in a highly developed market like the United States where, for example, the vast majority of home and small business owners do not purchase flood insurance. 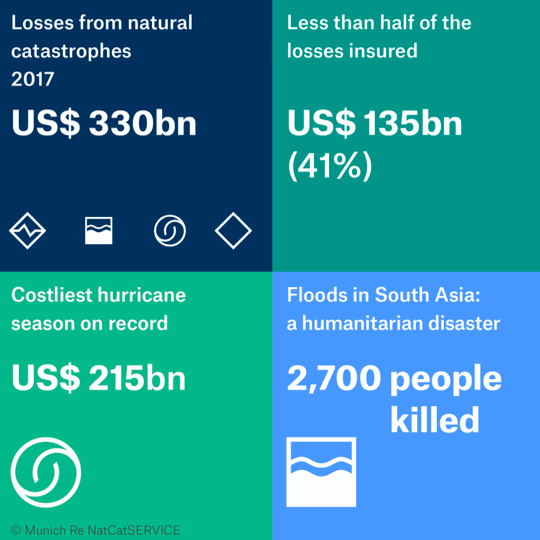 Ernst Rauch, Head of Climate & Public Sector Business Development, also said, “The above-average share of insured losses this year masks the reality of how little coverage many parts of the world still have. In many developing countries, losses from natural catastrophes often remain almost totally uninsured. And even in highly developed countries like the US, whose share of insured losses is significantly greater, more widespread insurance coverage would still be very beneficial to the economy.